Flavours: The draw and initial flavours are woody with twigs and dry leaves, leather and a smoky note (think smoked meats) with a maduro rich finish, the slight bitterness of green olives and a mild oiliness. More roasted ground coffee, nuts and very dark chocolate evolves with each puff, with olive leaf undertones and dried oregano. This is an absolute classic cigar, one of the best burns and draws I’ve encountered in a cigar. Beautiful. I want a box of these. The tobacco has, apparently, been aged for four years and this is certainly noticeable in the complex yet smooth flavours offered by this box pressed cigar. Some tweezers might be advisable, because I found myself puffing it until it reached the width of my fingers! Match with: Savour with espresso and a teaspoon of raw sugar, ginger beer or a Spanish style rum (Havana Club Seleccion de Maestros immediately comes to mind) or a Navy style rum such as Pusser’s Blue Label. It also pairs particularly well with an old cognac, with rancio notes in the eucalyptus and umami spectrum (DEAU Louis Memory). 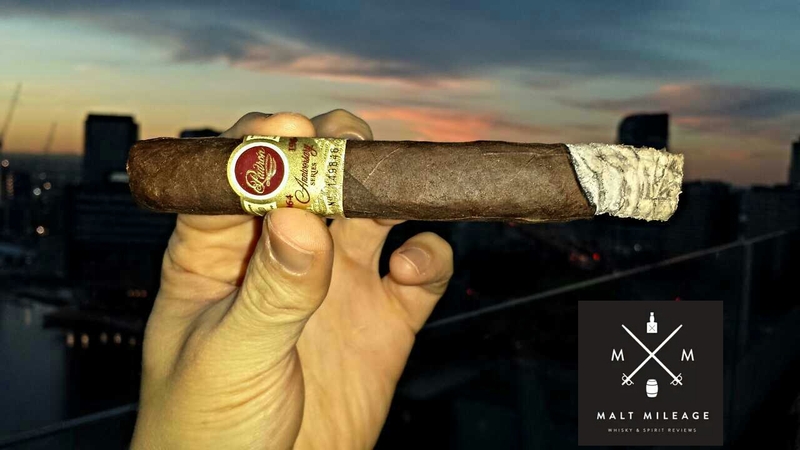 This entry was posted in Cigars and tagged cigar, coffee, Cognac, matching, nicaragua, padron, rum, smoke, tobacco. Bookmark the permalink.